In front of me stood what must have been the most beautiful “god’s” body in the whole of Phuket. Her gentle pink robe swayed above bare feet as she made her way in a trance through the crowd of devotees at the Chinese Jui Tui shrine. And her pretty face was pierced with a long spike, a piece of fruit stuck on its end. This woman was a “mah song”, roughly translated from the Thai language as “entranced horse” or “one whose body is used by gods as a vehicle”. She was the centre of attention for a good reason. For the day, she represented a god whose powers would help purify members of the community and wash away any bad karma. “The god has to hurt itself, for cleaning us from our bad deeds”, the brother of a mah song told a confused journalist, who was practically from another universe. This ritual takes place during the vegetarian festival in Phuket, a place normally better known for its sandy beaches and wild nightlife. The annual festivities last nine days in the ninth lunar month, a time when the local Thai Chinese community celebrates the Nine Emperor Gods festival. Don’t let the name “vegetarian festival” fool you – this is not a normal family event during which relatives gather around a table to share special food. The festival goes way beyond the tame meaning of its title, and it’s not for those with a weak stomach. Meat may not be on the menu, but the piercing of flesh is a big part of this bizarre event. The vegetarian festival tradition goes back some 150 years. The legend is that a Chinese opera troupe fell ill in Phuket, but after observing a strictly vegetarian diet and performing rituals to the Emperor Gods, they all made a full recovery. 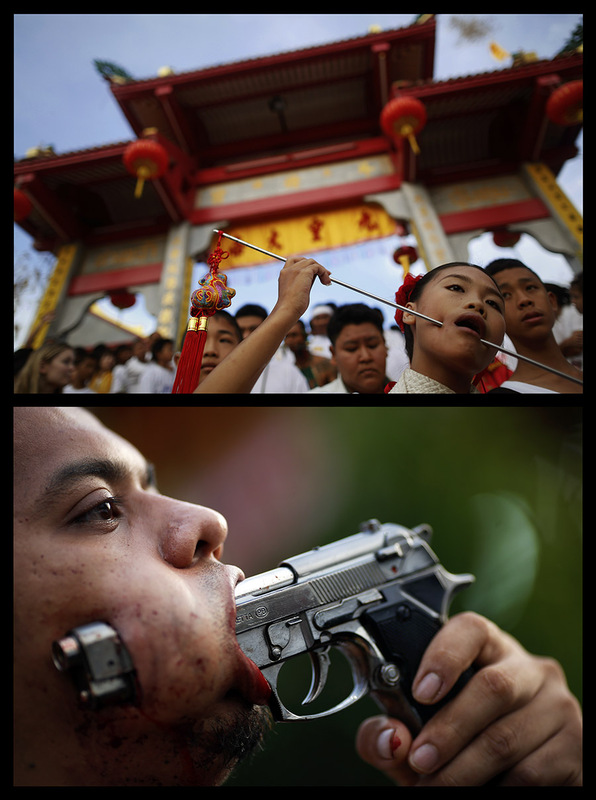 The same festival is observed in China, but the special dimension involving piercing and self-mutilation is unique to Thailand, and is believed to have been influenced by the Indian Thaipusam festival. The ritual starts early in the morning. Thousands of devotees wearing white gather at a local shrine before the dawn breaks and before the unbearable heat of southern Thailand kicks in. Everyone here wears white except the mah songs. They are the chosen ones and will soon slowly fall into a trance and give their bodies to a god. Their breathing accelerates as they make gestures and sounds that are not of this world – unless you are counting B movie Hollywood productions. After the trance takes hold, one of nine Emperor Gods takes possession of the mah song’s body. Tomorrow, he or she won’t remember what has happened. The only evidence will be photographs and ugly scars, which will serve as reminders of the ritual. Once in a trance, the mah song is not supposed to feel pain. This is a good thing, because on any other day, a mere glance at the arsenal of blades prepared for the ritual would be enough to make a person run away immediately. But here all the spikes, swords, knives and other sharp objects are regular festival props, which will soon be pierced through the cheeks of the chosen ones. Relatives help cut the mah song’s flesh, and make a hole so that the object – sometimes of truly impressive proportions – can fit through. 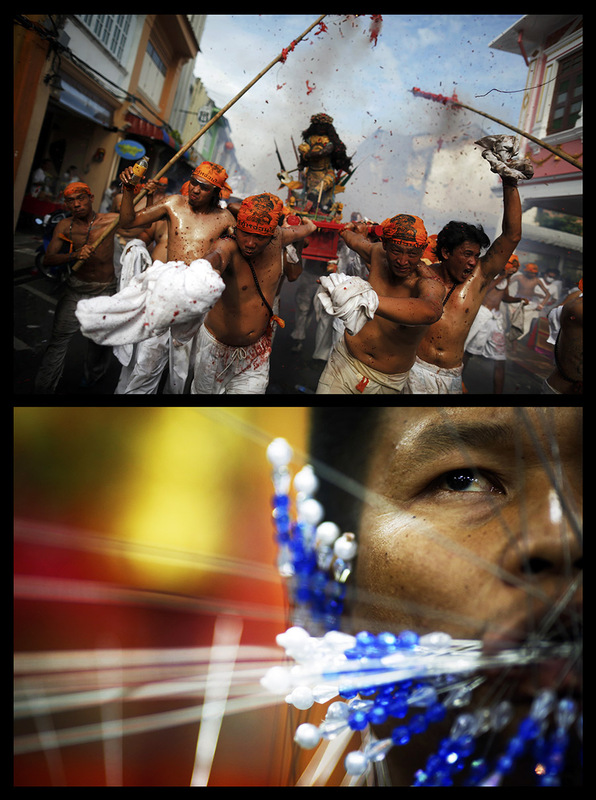 One, two or even twelve pieces of metal will remain pierced through their cheeks until the ceremony is over. Long hours of walking through what seems like a war zone, with a ridiculous number of exploding firecrackers going off, are ahead for these people who have – do not doubt it – unthinkable superpowers. They will walk, followed by thousands, through their neighbourhood touching others’ heads, offering candies and benedictions for the upcoming year. 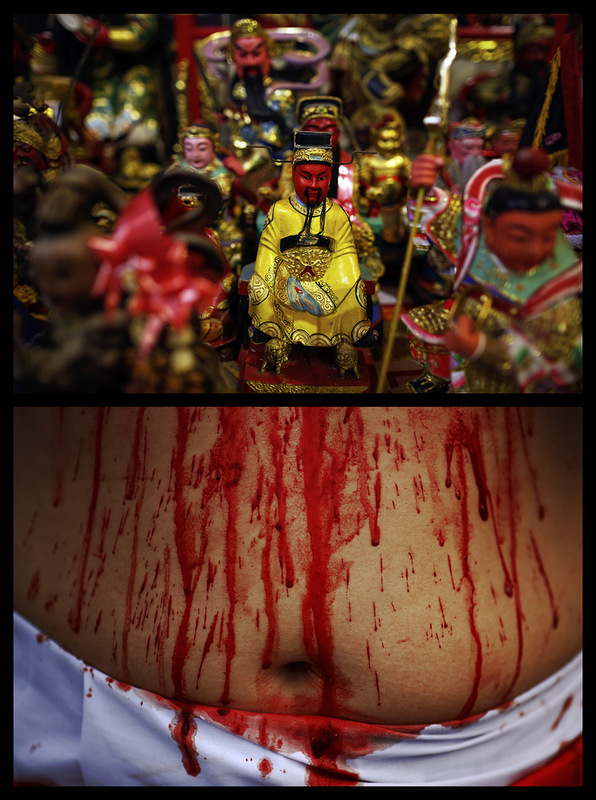 In some shrines, the mutilation gets very creative. A sharpened section of a car wheel, a pair of guns, an umbrella or a floor lamp – all can be used for the occasion. Sometimes two helpers are required to carry the objects that are pierced through the cheeks of a mah song. Self-mutilation, a theological concept that is not unknown in Christianity and Islam, is not a traditional part of Thailand’s dominant Buddhist religion. But for centuries, the Chinese community and its Taoist beliefs have played an important role in Thai society, so this tradition seems to be here to stay. Based on what I’ve seen over the past week, the festival is growing – just like the size of the objects used to pierce people’s bodies. It seems that the more spectacular the mutilation, the more effective the ritual purification is. Scientists have studied the phenomenon of the hypnotic trance, which helps shield the mah song from pain, for a long time. Although some say that subjects are only “faking”, other reports state that people in a trance state have the ability to “modify the pain”. As a matter of fact, the hypnotic trance is used by anesthesiologists in some European hospitals for patients who are addicted to pain killers or those with stomach ulcers who can’t take anti–inflammatory medicines. In any case, whatever makes the beautiful mah song I saw in her pink dress feel no pain is very special and deserves every form of respect. Having witnessed her trance, others from the festival, including a small army of journalists and tourists armed with cameras, will go back to the shade of their boring, terrestrial lives, happy with their pictures and richer for having seen something from another world. You can see more of these combo pictures fro Vegetarian festival here and here.